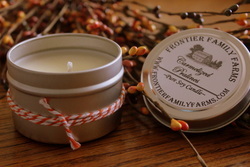 Our pure soy candles are available in 4 oz. tins with lids. Approximate burn time is up to 20 hours. * Set the candle on a level, heat-resistant surface and never move or re-light until flame is out and wax is completely solid. Container will be hot when candle is lit. * Each time before you light your soy candle, trim the wick down to ¼”. Do not allow wick trimmings or other debris to fall into the wax melt pool. * When lighting a soy candle for the first time, allow the wax to pool (liquefy) all the way to the sides of the container. This will result in a longer lasting candle without “tunneling” down the center. * Burn the candles in areas free from drafts and out of reach of children & pets. * The maximum recommended burn time for soy candles is 4 hours. * Never use container lid to put out flame. Blow out gently and replace the lid.